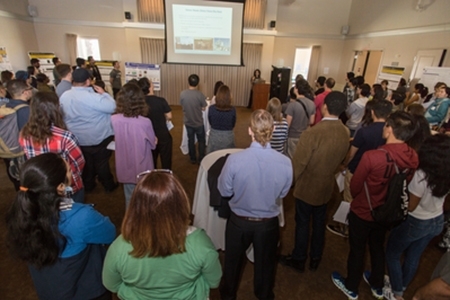 MACES, the Merced nAnomaterials Center for Energy and Sensing, held its second annual open house on April 19, showcasing student research and highlighting the center’s connection to NASA. The daylong event kicked off with remarks from MACES Director and Professor Jennifer Lu, who shared her vision for the center with a capacity crowd of students, staff and faculty. Though MACES is less than 2 years old, Lu’s vision is well on its way to becoming reality. Launched in August 2015 with substantial NASA support, MACES was established to develop nanoscale technologies that will enable future NASA space missions. In particular, MACES takes a multidisciplinary approach to solving major challenges associated with energy and sensing. As Lu explained, power systems account for nearly 30 percent of a spacecraft’s mass, and shuttling these bulky systems into outer space can be prohibitively expensive. MACES strives to develop highly efficient energy harvesting and conversion devices at an appreciably reduced size. MACES is also developing nanoscale sensing devices. These high-sensitivity instruments will be capable of monitoring human health, assessing the structural integrity of spacecraft, and detecting chemical and biological species in extraterrestrial environments, all while significantly reducing energy consumption. But research is only one facet of MACES’ mission. MACES provides undergraduate and graduate students with multidisciplinary, materials-based training in a collaborative environment that prepares them for the STEM careers of tomorrow. MACES also connects students with highly competitive NASA internships. In its first two years, MACES sent 12 students to NASA. Next year, 10 more will join their ranks. Of course, no all-day event highlighting the MACES-NASA relationship would be complete without a NASA astronaut in attendance. Tamara Jernigan, veteran of five NASA space flights and current senior advisor to the director of Lawrence Livermore National Laboratory, was the invited guest of honor. Jernigan was on hand for the morning poster session and later delivered the event’s keynote address. At the poster session, students described for Jernigan their work on perovskite photovoltaics, nanomaterials-enabled fuel cells, nanoscale supercapacitors, and ultra-hard, frictionless alloys. Jernigan responded with probing questions and insightful feedback of her own. The keynote address followed, with Provost and Executive Vice Chancellor Tom Peterson opening for Jernigan. Before introducing Jernigan to the standing-room-only crowd, Peterson delivered a brief statement that stressed the importance of MACES to UC Merced. In her own address, Jernigan discussed her trajectory from school to space, focusing on “character building” experiences from her space program days. Using photographs from her space missions, she described the challenges and joys of space travel. She also narrated a video from her fifth spaceflight, when she delivered and installed equipment on the International Space Station. Taking questions from the audience, Jernigan was asked whether there was a particular experience that ignited her passion for science and led her to pursue a career as an astronaut. “I wouldn’t say just one thing. I was always curious as a kid,” Jernigan said. But she was quick to add that her own NASA internship experience, along with her undergraduate and graduate research efforts, were instrumental in shaping her decision. The open house concluded with a tour of MACES laboratories. Attendees were led through UC Merced’s state-of-the-art imaging and nanofabrication facilities. The tour showcased the advanced instrumentation available to MACES affiliates and highlighted the fact that students and researchers alike have access to training and use of the facilities.